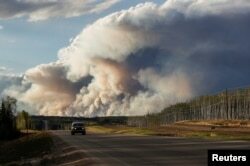 A wildfire burns near Highway 63 south of Fort McMurray, Alberta, Canada, May 6, 2016. Chad Morrison, senior manager of wildfire prevention at the Province of Alberta Agriculture and Forestry Division, said forest fires were continuing to burn out of control in the parched region, and could double in size. “This is a dynamic, challenging, extreme fire… so you know, many things can happen. But at this point, the prediction over the next two days is for the fire to move away to the northeast,” Morrison said Friday. The fires have engulfed 156,000 hectares of forest, including nearly 5,000 hectares in the area surrounding the community of Fort McMurray where 2,000 homes have been destroyed. Despite firefighters’ efforts, Morrison said blaze in Alberta's oil sands region will not go out until there is significant rain. Rainfall was possible Sunday. 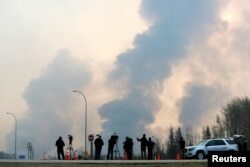 Journalists look on as smoke rises from wildfires south of Fort McMurray, Alberta, Canada, May 6, 2016. Margarita Carnicero was among the first evacuees to reach Wandering River, a community more than 100 kilometers south of Fort McMurray. Carnicero told the French news agency that she feared for her life on the journey to safety. "It was a terrible experience," she said, sitting in her dust-covered SUV alongside her teenage daughter Michelle. "I was afraid, but I tried not to show it (so as) not to frighten my daughter." Police positioned themselves at intersection to keep evacuees from coming back to get their belongings. The Canadian government forecast a 30 percent chance of rain on Sunday followed by sunny conditions on Monday. More rain is expected on Tuesday and Wednesday with 40 percent precipitation. Investigators are still trying to pinpoint the cause of the fires. More than 1,100 firefighters are battling 49 blazes across the western Canadian province — seven of them are totally out of control. Alberta Premier Rachel Notley said about 12,000 evacuees had been airlifted from oil sands mine airfields over the past two days and about 7,000 had been evacuated in police-escorted highway convoys. She said the goal was to complete the evacuation of evacuees from northern work camps by late Saturday. “I would say that the folks in my community are stronger, bolder, braver and more prone to succeed, and these setbacks aren’t going to stop anybody who came (to Fort McMurray) with that kind of spirit in the first place,” the city's mayor, Melissa Blake, told the Edmonton Journal newspaper. Once the crisis is over, officials will work toward rebuilding. “I think it will just be a stronger community when we come out of this,” Blake said. To deal with the needs of all affected communities, Notley started a recovery task force that is set to guide officials during the restoration. The Edmonton Journal reported that on Friday, the cabinet allocated $200 million toward a disaster recovery program for the area and financial relief of $1,250 per adult and $500 for each dependent. "It's likely going to be several weeks before the situation stabilizes," Royal Canadian Mounted Police Inspector Garrett Woolsey said. The Canadian government declared a state of emergency in Alberta. The province is the size of France and is home to one of the world's most lucrative oil industries. No deaths or injuries have been reported and at least 14,000 people have registered with the Red Cross.